CONCORD, N.H. (AP) — Measures helping the Portsmouth Naval Shipyard are included in the defense policy bill that President Donald Trump signed into law. Democratic New Hampshire Sen. Jeanne Shaheen says the law repeals a policy that targeted shipyard workers. It had reduced the per diem rate for civilian workers for each day while they were away from their families to provide maintenance to ships and submarines. 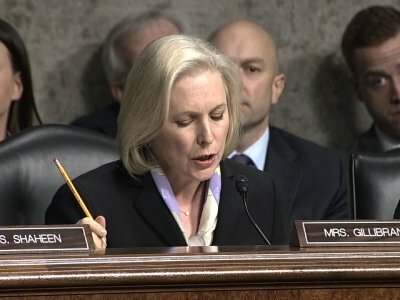 WASHINGTON (AP) — The Senate on Wednesday gave final congressional approval to a $716 billion defense policy bill that would raise military pay by 2.6 percent, the largest pay hike in nine years. WASHINGTON (AP) — Congress is abandoning an effort to loosen Cabinet control over an agency responsible for securing the nation's nuclear weapons stockpile. WASHINGTON (AP) — In an abrupt reversal, the Pentagon said Thursday it supports a Republican proposal in a defense policy bill that would bar the Fish and Wildlife Service from using the Endangered Species Act to protect two chicken-like birds in the western half of the U.S.
WASHINGTON (AP) — The Pentagon is objecting to a Republican proposal in a defense policy bill that would bar the Fish and Wildlife Service from using the Endangered Species Act to protect two chicken-like birds in the western half of the U.S.
WASHINGTON (AP) — The Senate on Monday approved a defense policy bill that includes a pay raise for the military and would block a White House plan to allow Chinese telecom giant ZTE Corp. to buy component parts from the U.S. The Senate has approved a defense policy bill that includes a pay raise for the military while blocking a White House plan to allow Chinese telecom giant ZTE to buy component parts from the U.S.
MINNEAPOLIS (AP) — Sen. Tina Smith has proposed an amendment to force completion of a land swap needed for the proposed PolyMet copper-nickel mine in northeastern Minnesota, a move that drew criticism from environmentalists Friday. WASHINGTON (AP) — President Donald Trump on Tuesday signed into law a sweeping defense policy bill that authorizes a $700 billion budget for the military, including additional spending on missile defense programs to counter North Korea's growing nuclear weapons threat. But there's a catch. The $700 billion budget won't become reality until lawmakers agree to roll back a 2011 law that set strict limits on federal spending, including by the Defense Department — and they haven't yet. 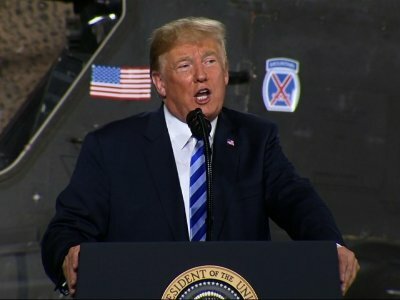 ALBUQUERQUE, N.M. (AP) — Members of New Mexico's congressional delegation say a sweeping defense policy bill awaiting President Donald Trump's signature includes funding for federal laboratories and military bases around the state. The defense authorization bill for 2018 sailed through the Senate on Thursday. The House approved the measure earlier this week. WASHINGTON (AP) — Congress on Thursday sent President Donald Trump a sweeping defense policy bill authorizing a $700 billion budget for the military, including billions of dollars more for missile defense programs to counter the growing nuclear weapons threat from North Korea. WASHINGTON (AP) — House Republicans and Democrats joined forces Tuesday to decisively approve a defense policy bill that authorizes $700 billion to restock what lawmakers have described as a depleted U.S. military and counter North Korea's advancing nuclear weapons program. WASHINGTON (AP) — House and Senate negotiators have agreed on an annual defense policy bill that authorizes $700 billion for the Pentagon in the 2018 fiscal year, a dramatic increase over the amount President Donald Trump sought as lawmakers aim to restock what they say is a depleted U.S. military. An annual defense policy bill agreed upon by House and Senate negotiators will authorize $700 billion for the Pentagon for the current fiscal year. Summaries of the legislation were released Wednesday by the House and Senate Armed Services committees. WASHINGTON (AP) — The Senate has overwhelmingly approved a sweeping defense policy bill that would pump $700 billion into the military, putting the U.S. armed forces on track for a budget greater than at any time during the decade-plus wars in Iraq and Afghanistan. The Senate has approved a defense policy bill that authorizes a $700 billion Pentagon budget. The measure sailed through the chamber, 89-8, even though lawmakers have yet to agree on a plan for waiving restrictions imposed by a six-year-old law to control government spending. Groton — State senate leaders will establish a Base Realignment and Closure task force in Connecticut to fight off any potential threat to the Naval Submarine Base in Groton, state Sen. Heather Somers, R-Groton, said Friday. Somers made the announcement at a news conference in which U.S. Sen. Richard Blumenthal, D-Conn., spoke out against a proposed amendment by U.S. Sens. Jack Reed, D-R.I., and John McCain, R-Ariz. to a larger annual defense policy bill. WASHINGTON (AP) — The Senate on Wednesday rejected a bipartisan push for a new war authorization against the Islamic State and other terrorist groups, electing to let the White House rely on a 16-year-old law passed after the Sept. 11 attacks as the legal basis to send U.S. troops into combat. KITTERY, Maine (AP) — Maine Sen. Susan Collins is introducing an amendment she says would repeal a U.S. Department of Defense policy she believes is unfair to some shipyard workers. Collins, a Republican, says her proposal would repeal the defense department's long-term temporary duty policy for shipyard workers who are conducting off-yard maintenance. She says the policy was enacted in 2014 and reimburses the shipyard workers at a reduced flat rate rather than the full rate. WASHINGTON (AP) — The Trump administration has adequate legal authority to combat terrorist groups and doesn't support a push in Congress for a new law permitting military action against the Islamic State and other militants, a senior White House official said Tuesday. WASHINGTON (AP) — John McCain is returning to the Senate next week after undergoing treatments for brain cancer in Arizona over the August recess. McCain is the chairman of the Senate Armed Services Committee and is expected to lead debate on a defense policy bill. The Arizona Republican will join the rest of his colleagues in returning to Washington after a four-week break. WASHINGTON (AP) — The GOP-led House on Friday overwhelmingly approved a defense policy bill for the 2018 fiscal year that would provide $696 billion in defense spending for the 2018 fiscal year. The policy bill plan provides a 2.4 percent pay raise for U.S. service members, which is slightly higher than the wage hike the Pentagon had proposed. WASHINGTON (AP) — The Republican-led House decisively approved a defense policy bill on Friday that declares climate change a national security threat, demands rigorous oversight of the Pentagon's cyber operations and rejects the Trump administration's bid to close military bases. 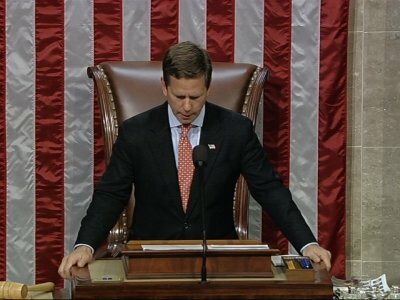 The Republican-led House has decisively approved a defense policy bill that declares climate change a threat to U.S. national security, demands rigorous oversight of the Pentagon's cyber operations, and rebuffs the Trump administration's bid to close excess military bases. The GOP-led House has narrowly rejected a measure that would have forbid the Pentagon from paying for gender transition surgeries and hormone therapy. Lawmakers voted 214-209 against Republican Rep. Vicky Hartzler's amendment to the annual defense policy bill. Democrats criticized the proposal as bigoted, unconstitutional and cowardly. WASHINGTON (AP) — President Donald Trump and France's Emmanuel Macron may be the world's oddest of political odd couples. Far apart on climate change and immigration, the two leaders will look for common ground on terrorism and defense policy when they meet this week in Paris. The president will be the guest of honor at this year's Bastille Day events — a celebration of French national pride at a time when, according to Macron, "our world has never been so divided." DUBAI, United Arab Emirates (AP) — He is known as MBS and his rise through Saudi Arabia's corridors of power has been shockingly swift. WASHINGTON (AP) — Jim Mattis is not lonely in the Pentagon, but two months into his tenure as secretary of defense not a single political appointee has joined him. THE HAGUE, Netherlands (AP) — An influential government advisory council is warning that the Dutch armed forces are "seriously neglected" at a time when threats from Russia and elsewhere are increasing. The report published Friday is aimed at influencing defense policy of the next Dutch coalition government, which will be formed after Parliamentary elections next Wednesday. CHARLESTON, W.Va. (AP) — The West Virginia National Guard says a scheduled appearance by Vermont Sen. Bernie Sanders at a southern West Virginia armory was canceled due to U.S. Defense Department policy. The Guard says in a news release that Defense Department policy prohibits the use of military facilities for political and election events, including town hall meetings. The West Virginia State Armory Board has a similar policy. WASHINGTON (AP) — The Republican-led House on Friday overwhelmingly backed a $611 billion defense policy bill that rejects a number of President Barack Obama's key proposals for managing the nation's vast military enterprise. Lawmakers passed the legislative package, 375-34. The bill now goes to the Senate where a vote is expected early next week. WASHINGTON (AP) — Thousands of California National Guard troops will not have to repay enlistment bonuses and benefits they received a decade after they signed up to serve in Iraq and Afghanistan, according to a deal between House and Senate negotiators. The agreement is included in a must-pass defense policy bill filed Wednesday and awaiting an expected House vote Friday, followed by action in the Senate next week. WASHINGTON (AP) — House and Senate negotiators reached agreement Tuesday on a sweeping defense policy bill that rejects a plan to force women to register for a military draft, a victory for social conservatives who decried the move as another step toward the blurring of gender lines. TOKYO (AP) — A top defense policy adviser for Japan's government on Monday proposed using U.S. President-elect Donald Trump's demand that Tokyo contribute more to its own defense as a chance to update the countries' security alliance to reflect Japan's greater military capability and today's harsher security environment. WASHINGTON (AP) — Congressional Republicans and Democrats will have to bridge a vast cultural divide over an issue that has nothing to do with bullets and bombs to complete a must-pass defense policy bill. WASHINGTON (AP) — Senate Democrats are intent on scuttling a House-passed provision that they say would undercut protections against workplace discrimination based on sexual or gender orientation.